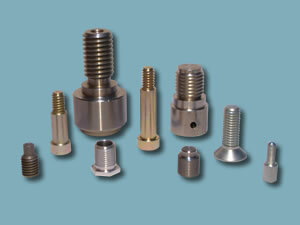 We have manufactured millions of components over the years in a wide range of materials and finishes. 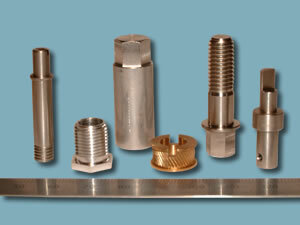 Below are some example of the variety of component types we are capable of machining. 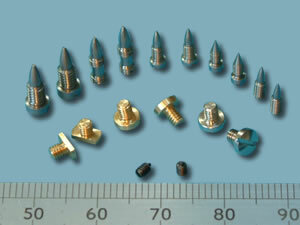 These components have been broached with hexagonal and special holes. We have a range of standard broaching tools for both internal and external hexagonal profiles as well special shapes such as triangles and torx profiles. We work in a wide range of materials including Brass, Copper, Bronze and Super Alloys. We can source most commercially available materials and also work with free issue material where required. We have years of experience with Non-Ferrous materials and can usually advise on the correct usage and highlight potential issues. 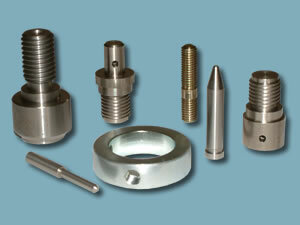 We are also experienced with the turning of hard metals such as Titanium, Tungsten and other super alloys. If you have a particular interest then feel free to call for more information. We offer both forming and cutting knurling, hard and soft to client requirements with a straight, diagonal or diamond pattern. Whether you are looking for a decorative finish or a serrated surface for locking or keying components together we can provide you with the required finished on bar as small as 2mmØ. 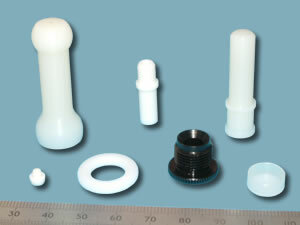 We machine plastic components for a wide range of industries. These parts are for milk, health and leisure boating industries. Materials we machine include Acrylic, Perspex, Nylon, 6, 11, 66, Polyethylene, Polypropylene, PVC, and Glass Reinforced Plastic. We also turn and mill free issue material and can order in specialist materials. We operate a service oriented towards high volume small sized component orders, the largest bar size catered for being 51mmØ. We offer thread cutting as part of the service. These components demonstrate a range of thread cut materials, plastics, aluminium and mild steel, as well as thread types, left and right hand threads. Some of these items are destined for the electronics industry manufactured in large quantities. The key strength of our turning capability is the use of twin spindle machines with live tools to produce a completed mill/turned component quickly and efficiently. The flat surfaces on these components have been milled as part of the single shot process. 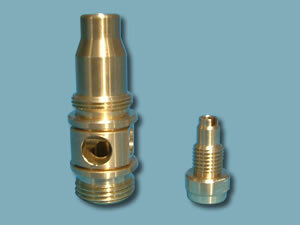 Our specialty is sub-10mm components. 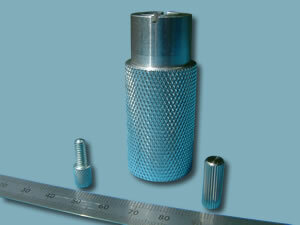 These items are typical of the smaller items we machine. 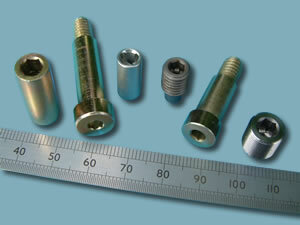 The components in the bottom centre are 1.5mmØ and threaded. All of these components have a thread.